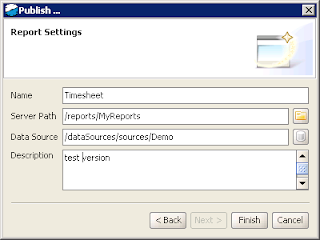 NextReports application allows for report publishing on a NextReports server. A NextReports server is a web application which manages data sources and reports and schedules reports to run at specific moments in time. To publish a report , the user must know a NextReports server (ip and port) and must have a valid account on that server (user and password). After the login the user is allowed to upload a report to server to a specific path. The user is allowed to create folders on the server. Also , if the data source is not already on the server, the user can publish the current report data source. The user can also download a report from the server making the work as easy as possible straight from the designer. You get your report from server , modify it and then put it back on the server, without accessing the NextReports web application .